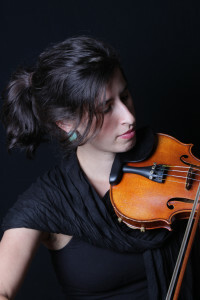 Mia Friedman is a virtuosic fiddler and singer. She is largely influenced by American roots music and old-time Appalachian traditions, and blends this with contemporary experimental music in her compositions. She graduated from New England Conservatory in 2012 where she studied with Anthony Coleman, Carla Kihlstedt, and Hankus Netsky, and is an active composer, performer, and educator. Mia has a private studio of fiddle students, and also teaches at two El Sistema inspired music programs in the Berkshires. Her song “Across the Water” won the 2011 John Lennon Songwriting Contest in the folk category, and she was the 2006 New Hampshire Highland Games Scottish Fiddle Champion. Aside from touring with Ari, she maintains her own solo act and is in high demand as a fiddle teacher.